Big Tony's PokerKard Arcade Machine is a 1-4 player sit down, touchscreen video game which incorporates a unique adaptation of the popular card game Texas Holdem’ Poker. Players can purchase a Pokercard to keep their points stored. The game accommodates up to four players and includes a single player game. 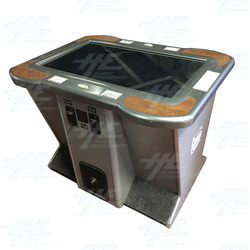 Specifically designed for the bar location with a state-of-the-art touch screen providing a fast, fluid play. Once players accumulate 25,000 points or more on their Pokerkard they can play the High Roller Game where bigger bets and name recognition on the Hi Rollers Top 50 is guaranteed! Big Tony's PokerKard Arcade Machine is a must-have for any bar or avid poker fan, and will draw in players from all across the floor. Big Tony's PokerKard Arcade Machine is a 1-4 player sit down, touchscreen video game which incorporates a unique adaptation of the popular card game Texas Holdem’ Poker. Players can purchase a Pokercard to keep their points stored. The game accommodates up to four players and includes a single player game. Specifically designed for the bar location with a state-of-the-art touch screen providing a fast, fluid play. Once players accumulate 25,000 points or more on their Pokerkard they can play the High Roller Game where bigger bets and name recognition on the Hi Rollers Top 50 is guaranteed! Big Tony's PokerKard Arcade Machine is a must-have for any bar or avid poker fan, and will draw in players from all across the floor. PLEASE NOTE: THIS MACHINE IS BEING SOLD AS-IS AND WITHOUT WARRANTY. THERE MAY BE OTHER FAULTS. INSPECT AT OUR OFFICE/WAREHOUSE ANY TIME DURING OFFICE HOURS. PLEASE DO NOT ORDER UNLESS YOU ACCEPT YOU ARE BUYING THE MACHINE AS IS, WITHOUT ANY WARRANTY.